Have you tried that place yet? As our annual Menu of Menus restaurant guide goes to press, we've been sampling some new joints that have opened up in the last year. Check out the new issue on stands in the coming weeks for more on what's new in town. 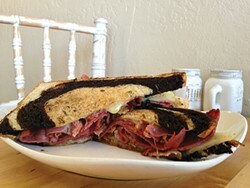 It's hard to look classy whilst cramming a big, grilled, cheesy, pastrami-packed Reuben into your mouth. And there are days when you want the taste of the sandwich, but maybe not the heart flutters afterward. Your solution is at Nourish Bistro & Catering (518 Henderson St., Eureka). Order up a Reuben at the counter and try not to be distressed when you are asked about your choice of bread, cheese and dressing ($8.50). Apparently there are those who want to tweak the classic, and that's their lifestyle choice. But maybe we need to address some actual issues and draft a Defense of Reubens Act that defines this American institution as a hot sandwich on rye bread with pastrami, Swiss cheese, sauerkraut and thousand island dressing. Do what you will in your own home, but you can't call it a Reuben without hurting all Reubens. Ahem. Nourish's version, cut into sharp wedges, is downright minimalist. This is not the daunting monolith you faced on your visit to New York — the tower of meat teetering to one side, a flimsy slice of bread stranded at the top like Fay Wray. Instead, it's toasty, swirly rye bread with a reasonable handful of satisfyingly salty Premier pastrami, sauerkraut and a swipe of thousand island. Piping hot so you can taste the fat of the meat, which is cut just enough with the tart kraut, it is a taste of the real thing that you can eat with dignity in your distressed, white, shabby-chic chair. The appeal of a crepe is its delicate nature. Sure, you love the lumberjack-powering stack of flapjacks meant to send you off to either haul timber or drop back into bed like a felled tree. But crepes are the pancake's refined French cousin, impractical, requiring special pans. Crepes are art for art's sake. Hum Grown Grindz, the red food truck that can be found lately parked at Bigfoot Supply in Willow Creek (41212 State Route 299) seems an unlikely source, but it's cranking out both sweet and savory varieties. The chicken chipotle pesto crepe is so stuffed it's thinking about being a burrito ($9). Did you get the wrong order? No, it's supposed to be that creamy, and with the basil, garlic and a little smoky heat, the sauce and tender chicken hit all the buttons. And so pretty! It's easily the fanciest thing you've gotten out of a truck in some time. The crepe itself is substantial enough to hold all that filling, pleasantly egg-y and moist. In fact, it still holds together after a car ride back to Eureka, where office mates descended like a starving French mob on the leftovers, which were still delicious. You think you're happy with the damp circle of particle board that is a packaged tortilla. And maybe you are. But a fresh, handmade corn or flour tortilla with its uneven edges and its delicate chewiness is to the hard-edged, pre-packaged kind as a crackling, oven-warm baguette is to a slice of Wonder. Sure, there's a time and place for the mass-produced stuff (late at night, with a jar of Nutella, under the cold scrutiny of your cat). But up against homemade? It's not even a fair fight. 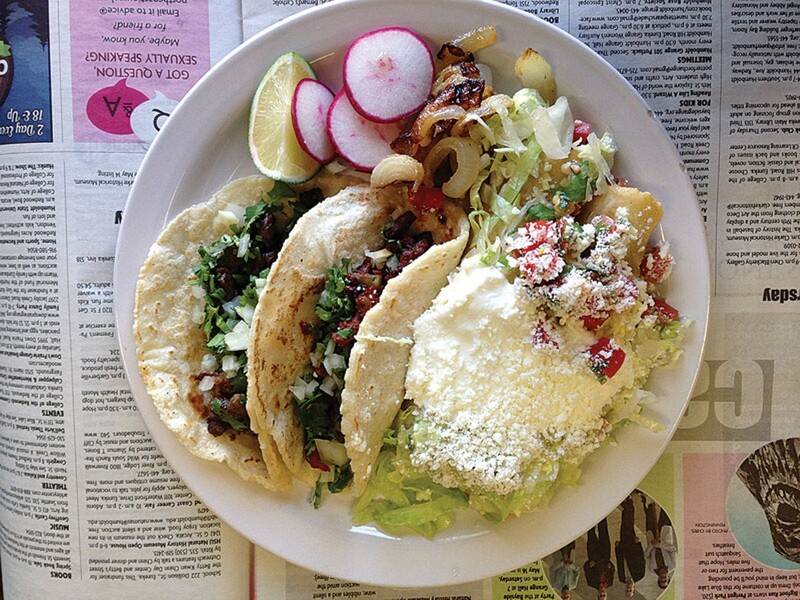 Two crews of happy, well-fed construction workers ambled out of La Patria Solis (1718 Fourth St., Eureka) yesterday. According to the waitress, everybody got the pastor and asada tacos ($2.49 each). The homemade corn tortillas are soft, warm and thick, cradling handfuls of chopped grilled steak with onion and cilantro. The asada has a little char to it, and the red marinade of the pastor is tangy and spicy, playing nicely off the sweet corn tortilla. Wait, the flour tortillas are homemade, too? We're getting flautas — beef, because it looks like one of those construction guys got the last of the lengua ($2.79 each). They come with sides, but you can order them a la carte and they'll show up with some grilled onions on the side, and a hefty dollop of sour cream and queso fresco on top. The cigar-like rolls are still tender, not over-fried, and the flavor of the tortilla reminds you why you will never really break up with white flour. Let the cat judge you for that. Tried something new lately? Can't stop ordering an old favorite? Send your hot tips to Jennifer@northcoastjournal.com and we'll dig into it for the Hum Plate blog at www.northcoastjournal.com.